1. Identify neurons and understand the functional relationship between the soma and cell processes. 2. Distinguish between glial cells and neurons and know the different functions of these supporting glial cells. 3. 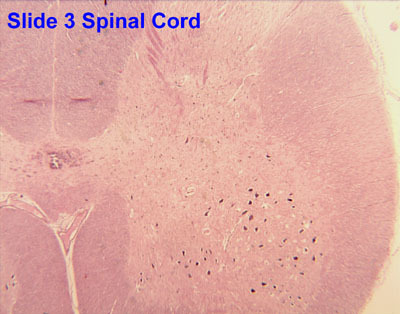 Identify and understand the connective tissue elements of the central and peripheral nervous systems. 4. Distinguish between specific organs/structures in the central and peripheral nervous systems (i.e. 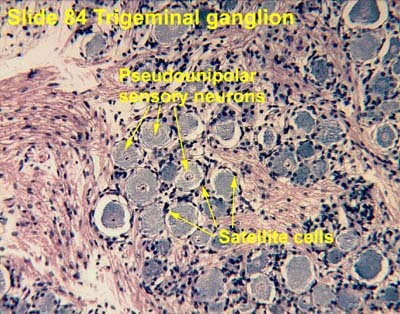 cerebellum, peripheral nerve, autonomic ganglion). SLIDES FOR THIS LABORATORY: 1-10, 32, 33, 51, 52 and 84. Note the H-shaped central gray matter (containing many neurons) and the surrounding white matter . The gray matter is organized as posterior (dorsal) horns and anterior (ventral) horns . 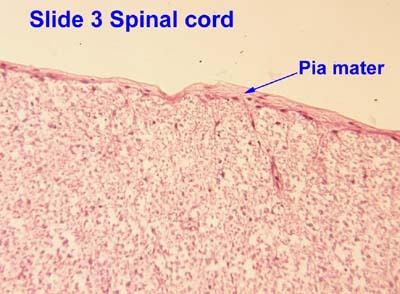 Also note the pia mater that is closely adherent to the spinal cord. 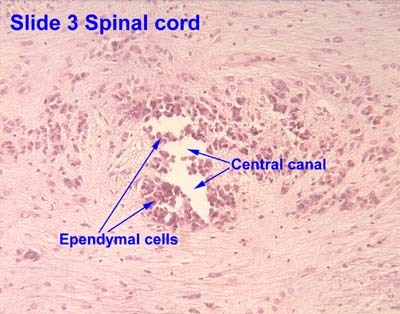 Identify the ependymal cells surrounding the central canal . 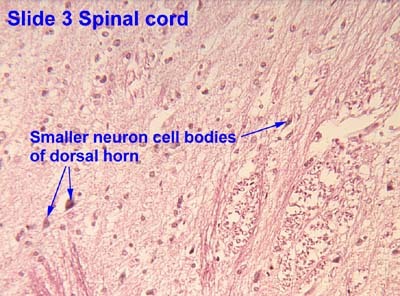 Observe the large neuron cell bodies (somata or perikarya) in the ventral horn and the much smaller cell bodies of the dorsal horns. 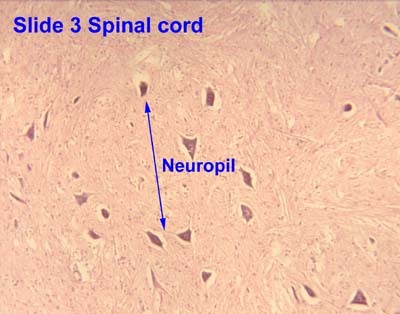 Identify the neuropil (the area between neuron somata composed principally of an intermingling of axons, dendrites, and processes of neuroglial cells). 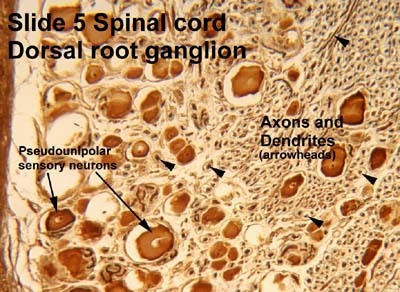 Identify the neural processes ( axon and dendrites ) and axon hillock of a large multipolar motoneuron. 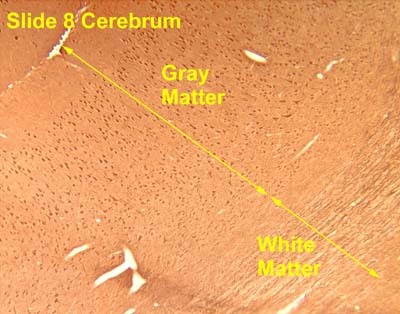 Observe the large number of nuclei of other (non-neuronal) cells within both gray and white matter. Although it is not possible to identify each cell type with certainty on this routine-stained section, most of these represent the nuclei of neuroglial cells (astrocytes, oligodendroglia, and microglia). Examine the white matter at high magnification and note nerve cell processes surrounded by empty myelin spaces and the nuclei of neuroglial cells . 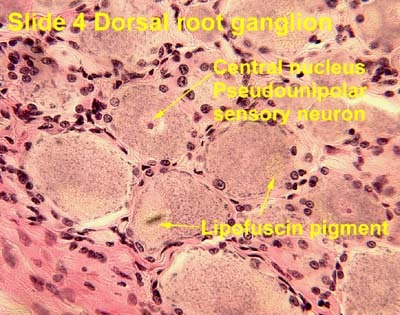 Slide 5 Spinal cord and dorsal root ganglion, Cajal stain. This slide is a special neurological preparation. 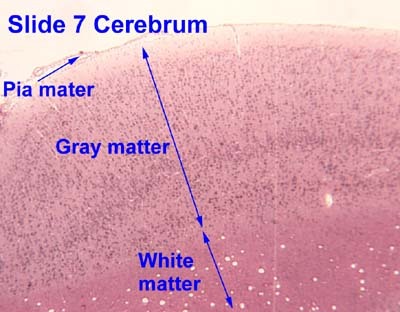 Note that the differentiation between white and gray matter is accentuated with this staining, technique. 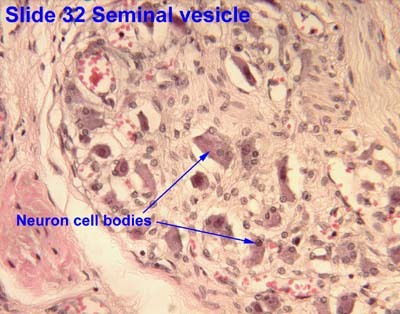 Compare the features seen with the routine (H&E) stained section of Slide 3 with those found in this slide (in this preparation axons and dendrites are stained dark brown or black). 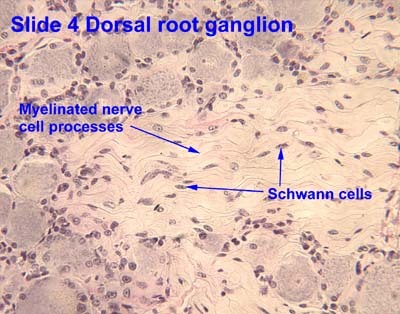 Find the dorsal root ganglion . 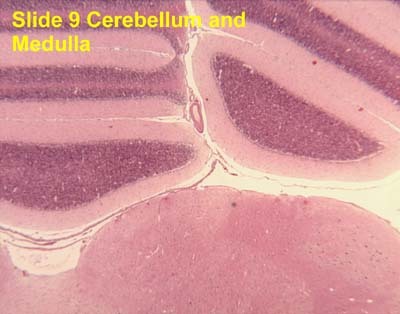 Slide 9 Cerebellum and medulla. 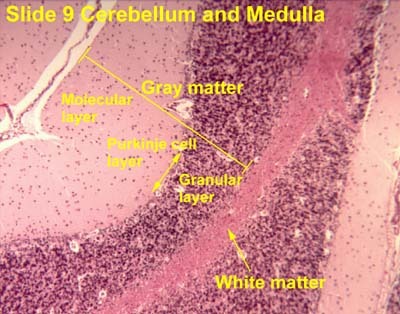 In the cerebellum, the gray matter consists of an inner granular layer , Purkinje cell layer , and outer molecular layer . 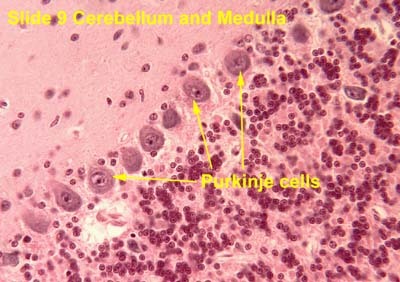 Identify the large Purkinje cells of the Purkinje cell layer. 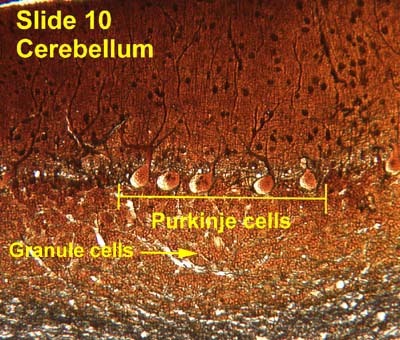 These three layers (molecular, Purkinje, and granular) constitute the cerebellar cortex . Observe the numerous granule cells (small neurons) constituting the granular layer. 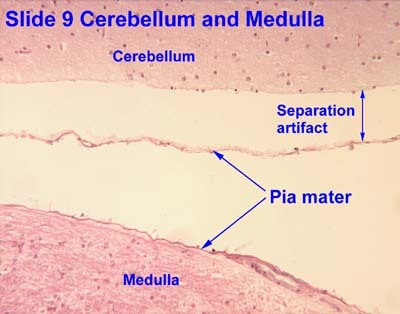 Note the pia mater closely adherent to the cerebellum. 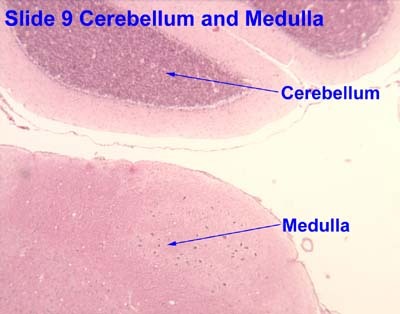 Note the differences between the cerebellum and medulla which are both present in this slide. 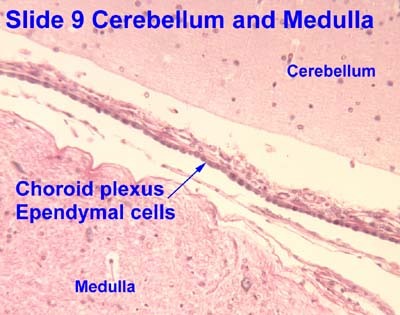 Locate the small amount of choroid plexus between the medulla and cerebellum. Observe the cuboidal appearance of the modified ependymal cells that make up the choroidal epithelium. 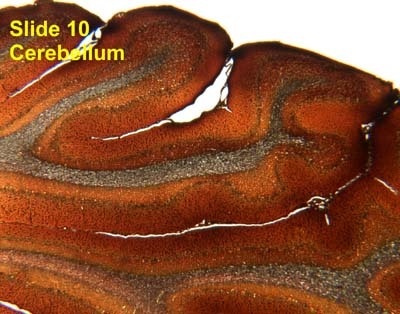 Slide 10 Cerebellum, Cajal stain. 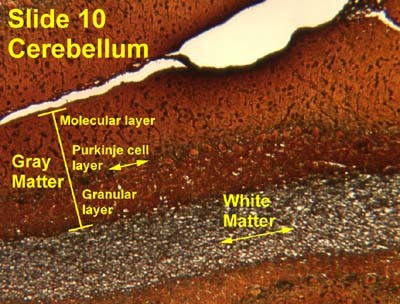 This slide shows a different staining technique. 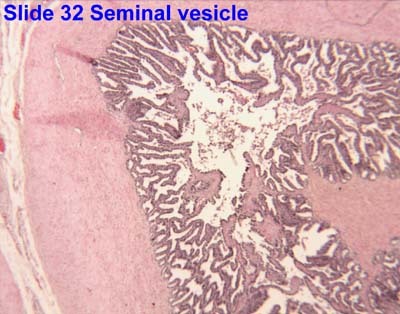 The same histologic features present in Slide 9 can be studied. 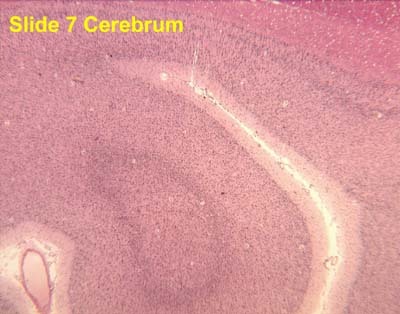 For reinforcement, again find the layers of the cerebellar cortex , Purkinje cells , and granule cells . 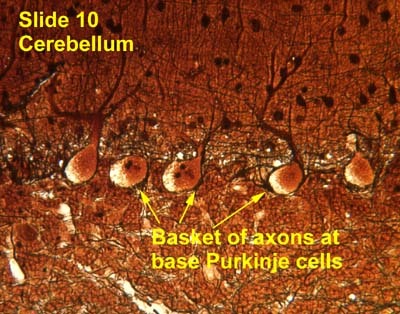 In addition, note that the Purkinje cells are surrounded by a "basket" of axons (axons and dendrites stain black in this slide). 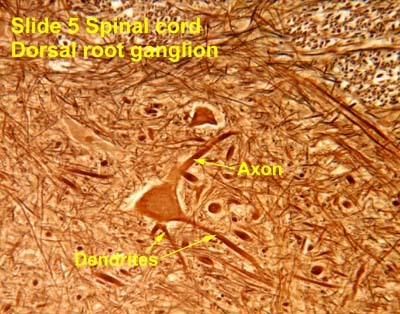 These axons contact the Purkinje cells forming axosomatic synapses. 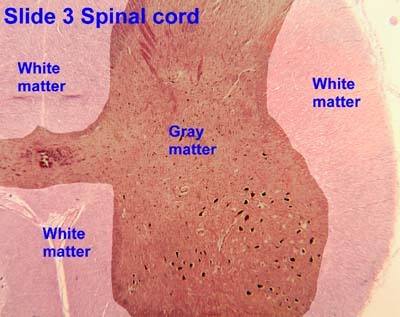 Most external in this slide is the pia mater , then gray matter , and most internally is the white matter . The gray matter is arranged in six ill-defined layers of nerve cells . 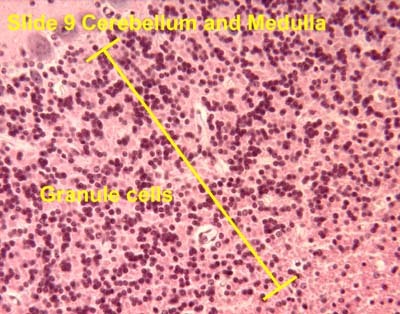 See if you can delineate the layers of cells in the cortex (you will not be required to do this for exam purposes). 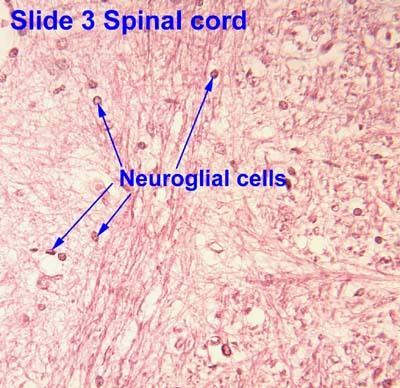 Study the larger neurons in the slide; they are pyramidal cells and are a type of multipolar neuron. 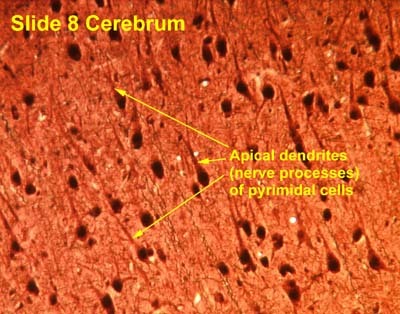 Observe the large apical dendrite projecting toward the surface of the cortex. 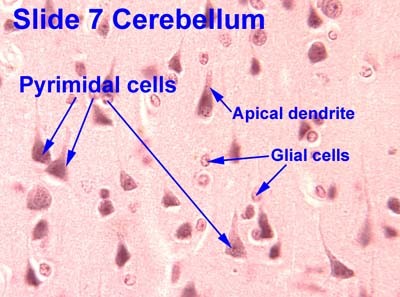 Observe the many nuclei of glial cells . 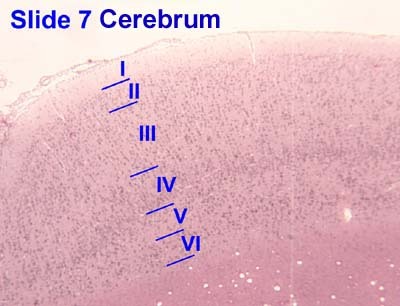 Slide 8 Cerebrum, Cajal stain. 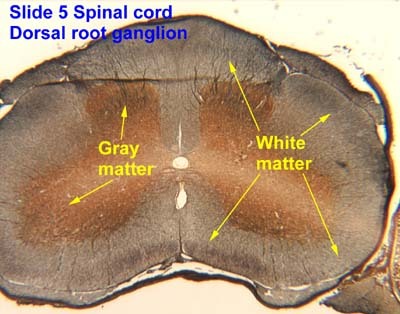 Note that gray and white matter differentiation is more pronounced with this technique and that the processes of neurons are more readily visualized. Note the various sizes of pyramidal neurons and the obvious apical dendrite of the largest neurons. 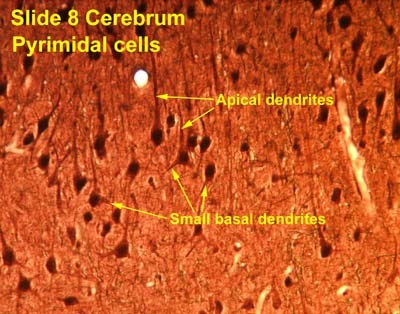 Try to distinguish smaller dendrites at the base of the pyramidal cells; these dendrites often project horizontally. 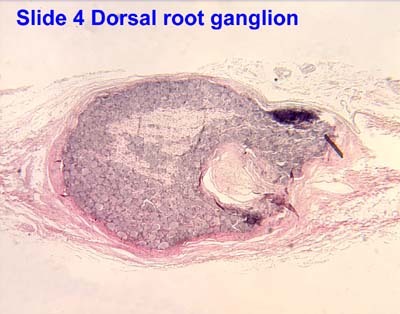 Slide 4 Dorsal root ganglion. Find the large cell bodies of pseudounipolar sensory neurons . These cells have accumulations of Lipofuscin pigment and round, centrally-located nuclei . The nuclei are lightly stained but have prominent nucleoli. 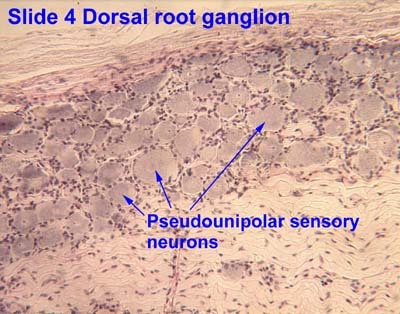 Notice that the neurons are not uniformly distributed within the ganglion but tend to be arranged in longitudinal bands separated by parallel bundles of myelinated nerve cell processes . 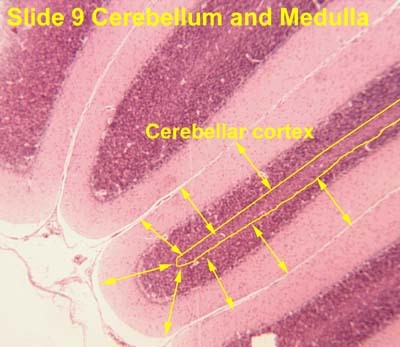 Note that the myelin is not stained but that you can see a wavy pattern produced by the bundles of nerve fibers. 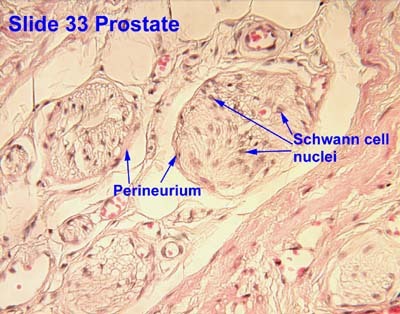 Many Schwann cells are present among the fibers. 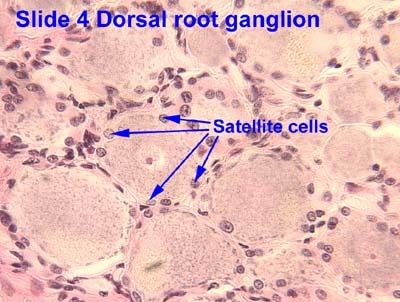 Observe the satellite cells which ensheath each sensory neuron soma. 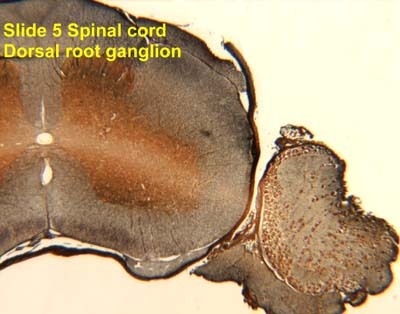 In this slide, locate the dorsal root ganglion outside the spinal cord. 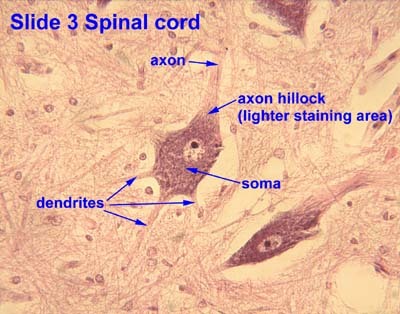 Myelin is unstained and axons and dendrites are black. Satellite and Schwann cells are NOT obviously evident. Compare the size, shape and arrangement of sensory neurons in this slide with those seen in Slide 4 . 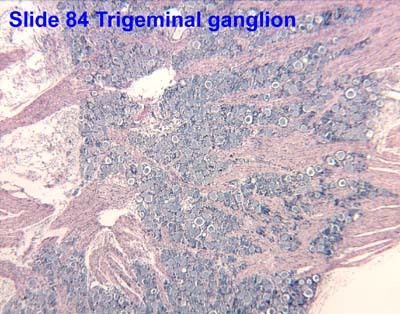 Slide 84 Trigeminal ganglion, hematoxylin and May-Grunwald-Giemsa stain. Again observe the sensory neurons and satellite cells . 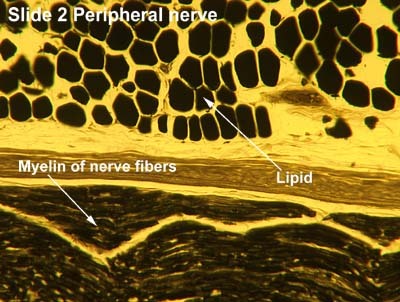 Note that the structure and orientation of nerve fiber bundles is similar to that of Slide 4 . 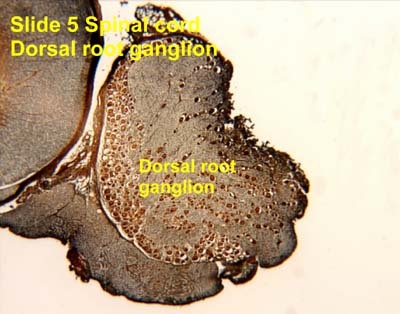 Unless the spinal cord accompanied the latter slides it would be impossible to distinguish the dorsal root ganglion from the trigeminal ganglion. 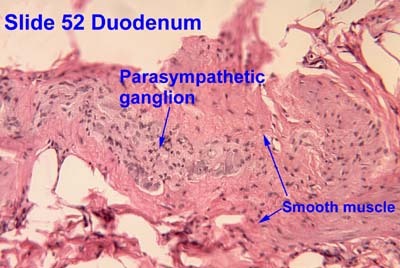 Observe neuron cell bodies and satellite cells in this autonomic (sympathetic) ganglion. 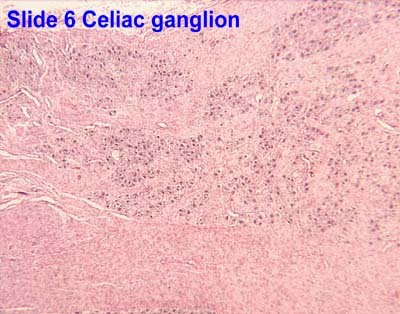 Note that the cells appear to be ovoid and slightly angular in shape. Even though these are autonomic (multipolar, motor) neurons, the smallness of their dendrites and the layer of surrounding satellite cells obscures the angular nature of the neurons. 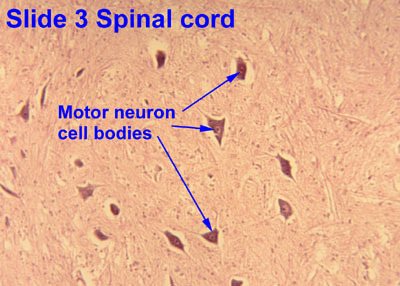 Many of the nuclei of the neurons tend to be located in an eccentric position. The nerve cell bodies are randomly scattered throughout the ganglionic mass, and the bundles of nerve cell processes are arranged irregularly rather than in discrete bundles. 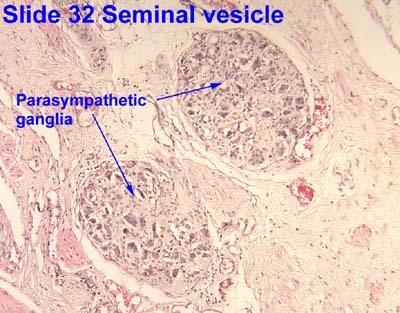 Find one or more small, parasympathetic ganglia located within the connective tissue of the gland. 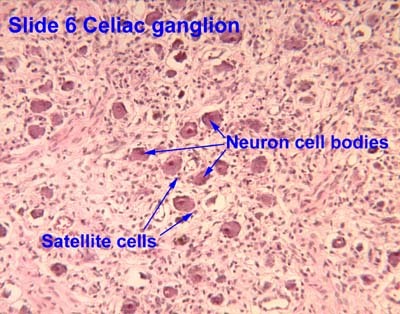 One to several neuron cell bodies may be present in these small ganglia. 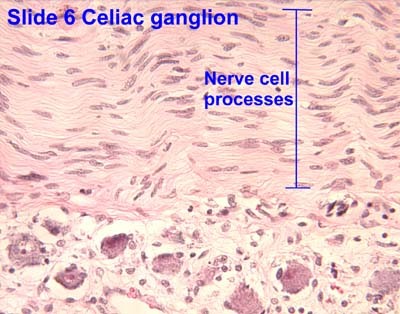 Note the similarity to the celiac ganglion. Parasympathetic ganglia are often located near or within the organ that they innervate. 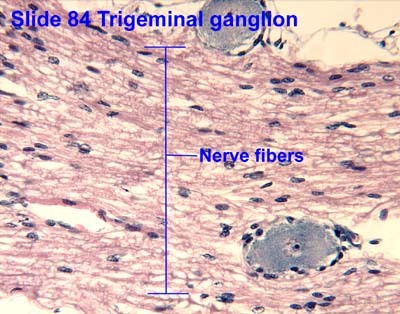 Therefore, the post-synaptic (post-ganglionic) efferent nerve fibers tend to be shorter than those from neurons located within sympathetic ganglia. 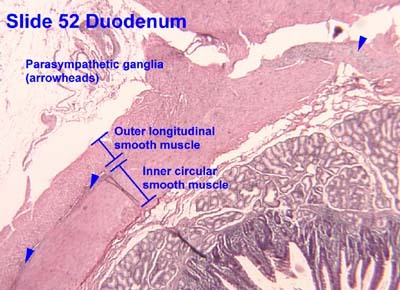 Also look for small peripheral nerves in the wall of this organ. 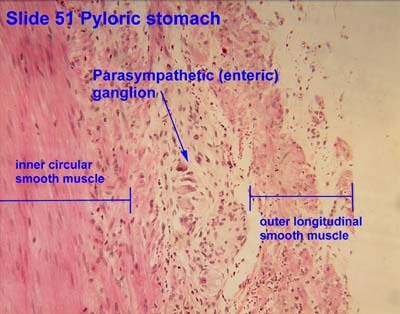 Observe parasympathetic (enteric) ganglia between the inner circular and outer longitudinal layers of smooth muscle. These are called Auerbach's (myenteric) nerve plexi. 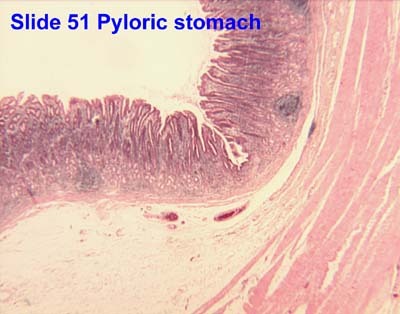 Again, observe parasympathetic (enteric) ganglia (Auerbach's plexi) between the i nner circular and outer longitudinal layers of smooth muscle. 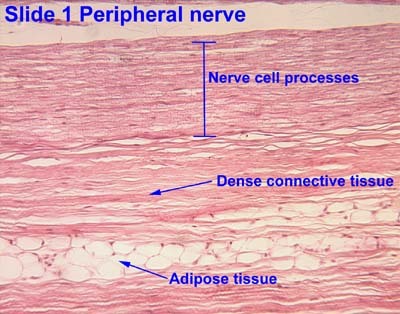 In the cross section, note that the peripheral nerve contains at least two nerve fasicles separated from each other by connective tissue containing fat cells. 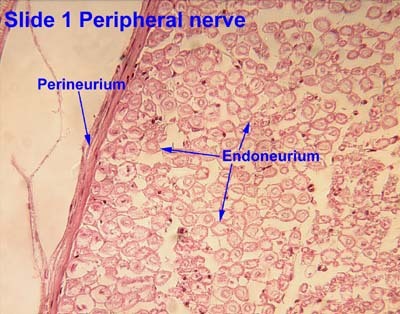 Identify epineurium , perineurium , and endoneurium . 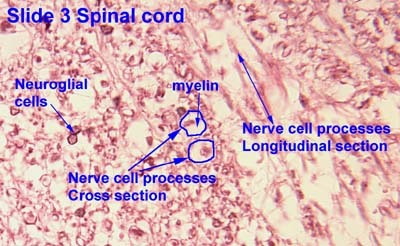 In the longitudinal section, notice the regular parallel orientation of myelinated nerve cell processes and connective tissue in longitudinal section. 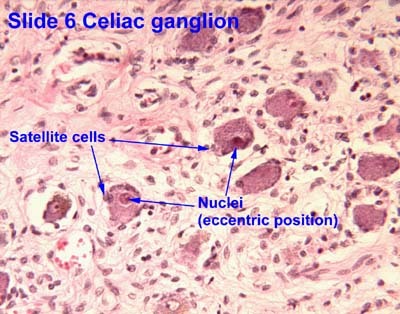 At high magnification, note the elongate nuclei of Schwann cells . 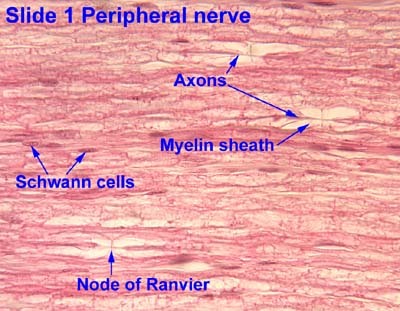 Also find axons , myelin sheaths (of Schwann), and nodes of Ranvier . 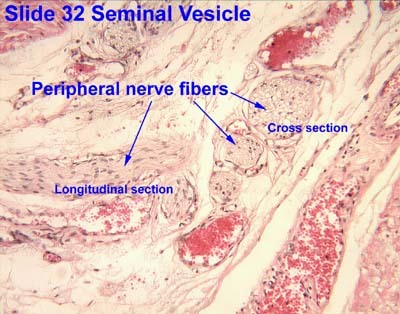 Slide 2 Peripheral nerve, osmium stain. 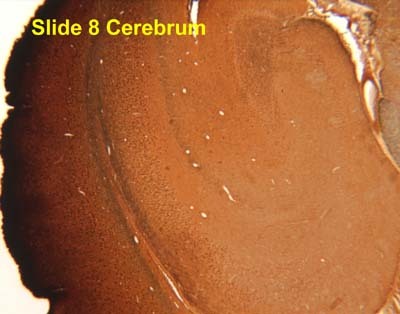 The staining technique in this slide demonstrates lipid , the predominate component of myelin . Compare with Slide I and note the similarities and differences. 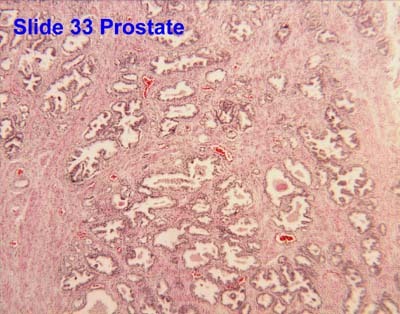 Slide 33 Prostate and prostatic urethra. 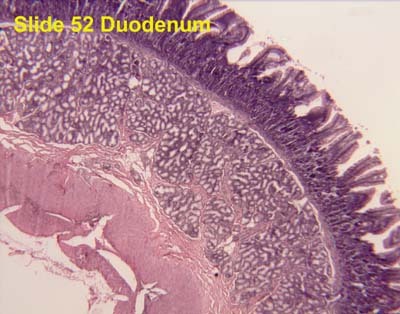 Find the small peripheral nerves located in the wall of this organ. 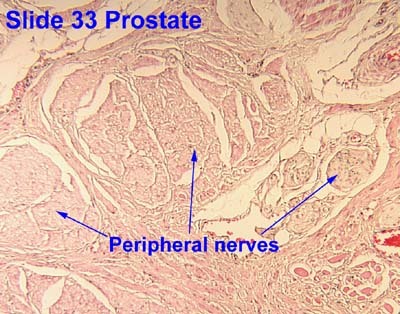 The small nerves are most easily found at the periphery of the organ and running near blood vessels. They are generally surrounded by an intensely stained perineurium . 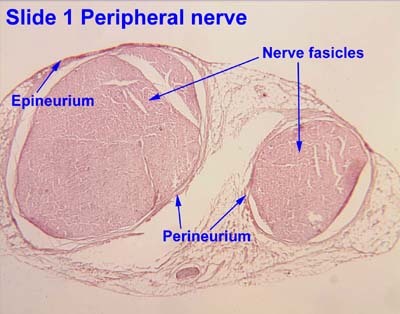 The nerves have a wavy appearance and have many Schwann cell nuclei among the nerve fibers.